Does Romney Actually Have a Bigger ‘Ground Game’ Than Obama? Could dark money groups help Romney overcome the Obama campaign’s “ground game” advantage? Two of the pivotal field offices in the country making phone calls to voters in swing states aren’t in Ohio or Colorado—they’re in Idaho Falls and Rexburg, Idaho. Frank VanderSloot, head of a controversial “multi-level marketing” corporation that sells dietary supplements and cleaning supplies, is donating two of his company’s offices to Americans for Prosperity (AFP) to “create one of the largest call centers in the nation.” According to local reports, AFP is recruiting teenagers and others in Idaho with a promise of $10/hour to make anti-Obama calls to voters in key states. The combined efforts of VanderSloot, an avowed conservative billionaire and financier of the Romney Super PAC, and AFP, the dark money group led by the Koch brothers, may be Romney’s last hope in unseating President Obama. The conventional wisdom, expressed by several media outlets in recent weeks, is that Obama’s campaign has an incredible advantage because of its “ground game.” The Obama team, the story goes, has more field offices than Romney, and will use these assets to better deploy get out the vote efforts through Election Day. While it’s true that Obama has considerably more field offices than his opponent, especially in swing states, the campaign-versus-campaign comparisons belie a shift in resources on the right. Hundreds of millions of dollars—most of it from right-wing fronts that do not disclose their donors—are being spent to bring pro-Romney voters to the polls. Thanks to a loose interpretation of our disclosure laws, these electioneering efforts have gone largely undetected by the Federal Election Commission, making them even more secretive. In recent years, Republicans have invested incredible sums to develop groups focused on grassroots organizing. American Majority, the dozens of State Policy Network institutes, Americans for Prosperity, FreedomWorks and American Action Network are among the new or recently expanded conservative nonprofits that spend a significant amount of their budget just on organizing. AFP, which has a $140 million budget this year, up from $14 million in 2008, has about 200 paid staff going into the election. These groups, along with the unprecedented effort by large employers and trade associations to coerce their employees into voting GOP, might more than level the ground game between Romney and Obama. Take Ohio, the state that is likely to decide the election. In the Buckeye State, Obama has 131 field offices compared to Romney’s forty. That may seem like a stark difference until you consider Romney’s outside-money allies. 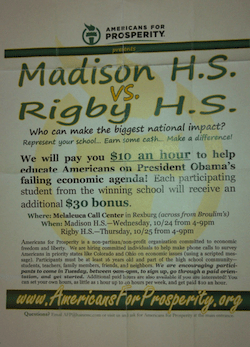 American Majority has four offices in Ohio directing efforts to bring people door-to-door to “Fire Obama;” Americans for Prosperity has six offices in the state and at least four paid organizers; and FreedomWorks is coordinating with at least seven local Tea Party groups to GOTV. Other right-wing groups sending field staff to Ohio: Heritage Action, the NRA, the Susan B. Anthony List, the Republican Jewish Coalition, Crossroads Generation, True the Vote and the Faith and Freedom Coalition. Ohio is also ground zero for a number of large companies that have pushed their employees towards the GOP. Murray Energy, the privately owned coal company based in Pepper Pike, Ohio, reportedly forced its workers to attend a pro-Romney rally without pay. Cintas Corporation, a Cincinnati-based firm, sent an election-related letter complaining about Obamacare. The problem in comparing Romney and Obama’s campaign resources is one of transparency. Traditional campaign committees, like Romney for President or Obama’s Organizing for America, must report every expense; so we know how much each is spending on field operations—leading many in the media to proclaim that Obama is better prepared to mobilize his base. There are other factors to consider. Many large evangelical churches in Ohio have indicated that they will distribute pro-Romney voter guides. Labor unions, which are subject to disclosure requirements from the Department of Justice and FEC, are deploying to augment the Obama campaign’s outreach to voters. But it’s difficult to discern how much dark money groups like the US Chamber of Commerce or Americans for Prosperity are devoting to GOTV, or how much employers are spending to communicate with their workers on the election or even offer rides to the polls. At the end of the day, Romney appears to not only have an advantage on the airwaves through paid media; he’ll enjoy considerable support connecting to voters. Lee Fang blogs about the intersection of money and politics. Read his previous dispatch on the corporate lobbyists who run our presidential debates. Subscribe to the Nation Election 2012 mailing list for more election coverage.